The bar scene in Madison… it is pretty great. Every Thursday – Saturday night you can see people waiting in line at the various bars on State Street. 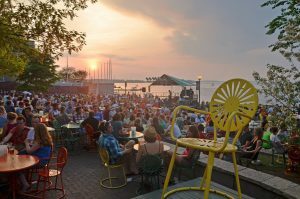 The problem, though, is that Madison offers so much more than just fun bars, and we need to take advantage of this. So if you need some inspiration for a great Saturday night that doesn’t involve the Kollege Klub, this list is for you. What better way to start a night than getting up to 30 friends to enjoy a sunset boat cruise on Lake Monona!? Yes, that’s right… this boat can fit up to 30 people. Oh, and you can also everything needed for brat fry as there is a grill on the boat. So gather your friends, put on your swimsuit, and go book your event while it’s still warm out! Madison has some awesome plays to go see some live music, and nothing grabs my intention more than that huge Orpheum sign on State Street. The Orpheum theater has had some amazing artists, bands, comedians, etc. perform there and with its beautiful venue – it definitely makes for a great night! Now, I know we all know about the Terrace. But people sometimes forget all the events at night for everyone to enjoy there. Whether it be concerts, open mics, or movie nights, there is usually something going on each weekend! Next time you’re looking for something to do at night in Madison, try to stay away from the bars. Get on a boat, go see a concert, or just explore! It’s time to see all that Madison has to offer.